Join us for a challenging and fun opportunity for committed music students to grow as musicians and artists, and to play with outstanding fellow musicians. 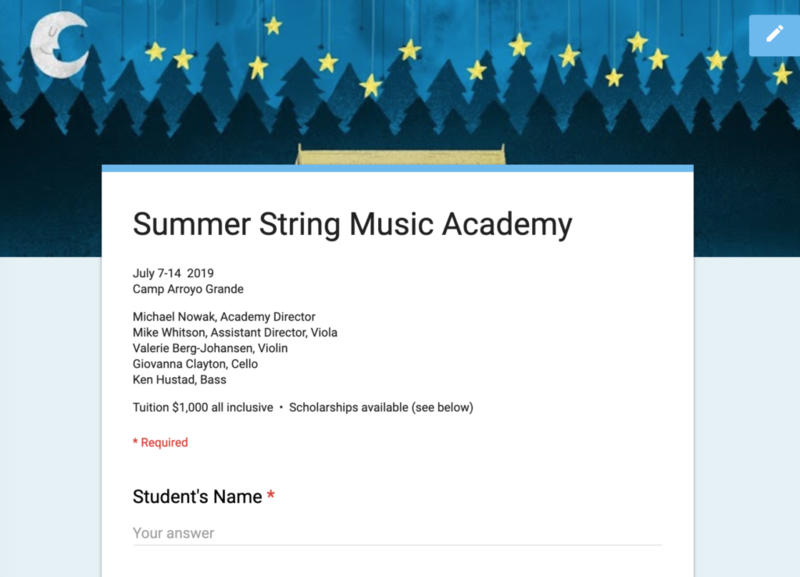 Music students from San Luis Obispo County and across the country meet up for a week-long, overnight, immersive summer camp experience on the Central Coast. This is an extraordinary opportunity to deepen your musicianship, make friends, and have lots of fun! The week will be comprised of full string orchestra rehearsals, chamber groups, sectionals, and a culminating performance. Individual coaching opportunities will be made available. There will be time for social activities, outdoor games, and plenty of time to enjoy the beauty of the camp’s natural surroundings. Students must complete the application form and submit an electronic or signed copy with a $25 audition fee. A limited number of applicants will be accepted. This camp is open to students age 12 through 18. Send your audition video to Sarah Maggelet at [email protected] with the subject line as “SSMA audition video-[instrument]. Include a 2-octave scale and a solo piece of your choosing. This can be a .mp4 or .mov file, or a link to a Youtube or Vimeo video. In the event that you wish to enroll after the dates listed above, please contact Sarah Maggelet at [email protected] to make other arrangements. For any additional questions, email Sarah Maggelet at [email protected].